The iPhone 5 might be the most hyped product of iOS. The iPhone 5 came and it is wonderful. A new A6 processor, LTE, 4 inch screen, and new design all contribute to the success it has. The iPhone 5 is an amazing phone the best phone I have ever had. The iPhone 5 was rumored to come out last year but instead a 4s was announced. However the iPhone 5 is here and it’s wonderful. Read our iPhone 5 review. iPods seem to be a second thought for Apple now. The product that once defined the company seems to be lost as Apple focuses more on the iPhone. However the iPod line (except for the classic) got an upgrade this year. The new iPod touch got a 4 inch display along with the iPhone 5, a new design, colors, a 5 megapixel camera, and even a little strap for your wrist. The iPod nano got a redesigned body and a bigger screen. The shuffle got upgraded colors I think. Ever sense Steve Jobs held up the first iPad on stage in all it’s glory there have been rumors for a smaller iPad. Steve stated that a smaller iPad would not be needed and users would not enjoy one in a conference call. That didn’t stop rumors from spreading madly through the internet. I too thought a smaller iPad would be pointless until they really announced it. Apple unveiled the iPad mini in October with an 8 inch display, thin design, Slate and Silver back, A5 processor, and even more. 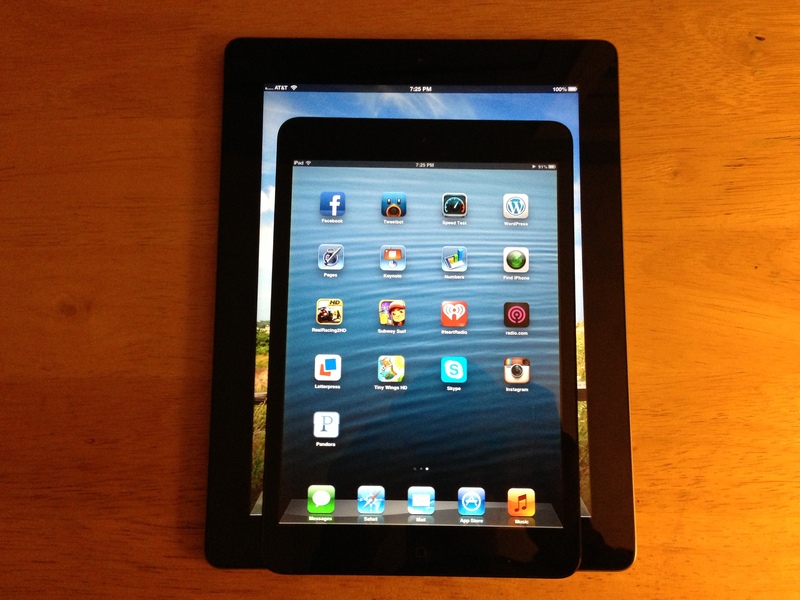 The iPad Mini came out with the iPad 4 on November 2nd and it is growing with consumers. It is a little bit of a better fit then the iPad. However there does need to be a better screen, however this is only the first generation and I have hopes for the future. 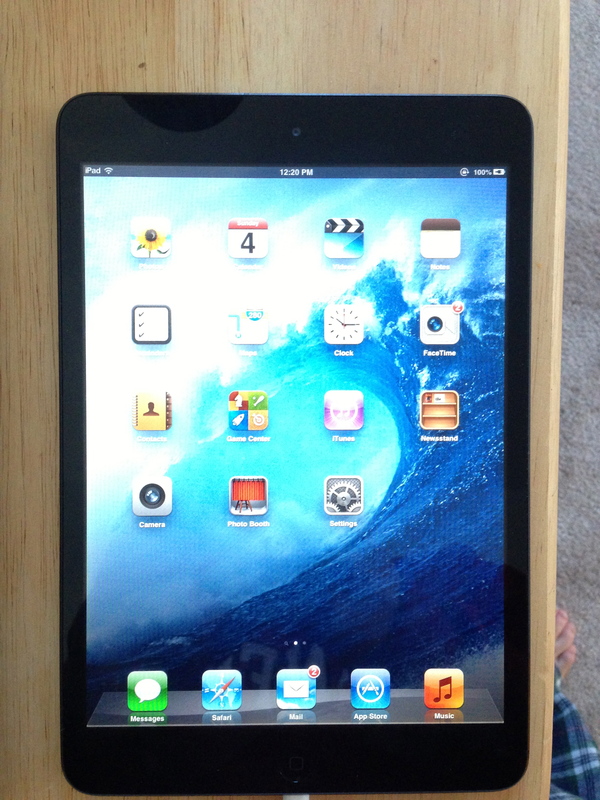 Read the iPad Mini Review. There is no denying the Retina Macbook pro is a gorgeous machine. The retina display makes anything else look low class. Not only does the Retina Macbook pro have a higher resolution screen it was the first MacBook pro to ditch the CD/DVD drive. The MacBook air had ditched this a long time ago and now the MacBook pro has joined. Everything really you want is downloadable on the developers website or the Mac App Store. Plus if you can’t live without one then well just buy the drive for $80. The MacBook pro also got an HDMI out connector and a much thinner design. I have the first Aluminum iMac from around early 2007 I want to say and I love it. I still use it for games and even this site from time to time so I am excited they sort of changed the design a little bit. The iMacs before were basically the same 2007 rendition just a little bit thinner with an SD card reader added to them which really nobody needs (I have one on my MacBook air and I haven’t even touched it). The new iMac is crazy thin. It’s somewhat incredible to think they can still fit the entire iMac into it. However thin does come with compromise. You will have to give up your CD/DVD drive but that’s not such a problem because again you can download everything. I like the new iMac a lot. I would defiantly recommend it for someone who wants a desktop computer though. I am going to be completely honest. iOS 6 was a big disappointment and I think Apple knows it. Maps doesn’t bother me because well it get’s me where I need to. However there was too little. Passbook? Okay. Redesigned UI for some Apps? Ehhhhh boring. Panorama is cool. LTE Facetime? Should not be a major feature. Siri? Siri was with the 4S and still needs developer support. I hope Forestall getting fired means we will see change and soon. I have hopes for iOS 7. So that was 2012 for you. Amazing products and more are to come in 2013. I will be posting getting started guides for iPads, iPhones, and Macs for Christmas in the following days. Happy Holidays! The first thing I want to start with is the design. This is now a smaller iPad, if anything it is a bigger iPod Touch. The design is the exact same without the color options really. Same form factor as the new iPod Touch just without the colored aluminum on the back. It is the same slate or silver you find on the new iPhone 5 with the mirror sort of bezel around the screen. The home button is smaller than the iPhone 5 which is surprising and has sort of the same solid feel the iPhone 5 has where you don’t have to worry about it breaking after using it so many times. There is on the bottom for the first time stereo speakers next to the brand new lightning connector that made its debut with the iPhone 5. There is 2 volume up and down buttons where it’s big brother has sort of the unified rocker and of course the mute/rotation slider. On the back a 5 megapixel camera and the front has a facetime HD camera. All of this delivered in a device as thing as a pencil. Let me tell you it feels good in the hand(s). A lot better than the iPad 2/3/4 that could cut into your hands with the teardrop design. The screen is honestly the only real problem I have with this device. After being spoiled with the retina display in the iPad 3 and iPhone 5 the screen is a disappointment, however it is not as bad as everyone is making it to be. The only thing is yes text does look terrible. However if you are playing a game or even using it for a couple of minutes your eyes will adjust and it will be fine. The colors are bright and so is the screen. There is no way they could have put a retina display in something this small and thin. Maybe next year they will have the technology for it. The software for the mini the user can tell is pretty basic iOS 6. You got the now famous maps app that you may hate or love and some other goodies. Now the things the user doesn’t notice is what gives Apple the advantage. Apple makes their hardware and software so they can make the software perfect for the hardware. 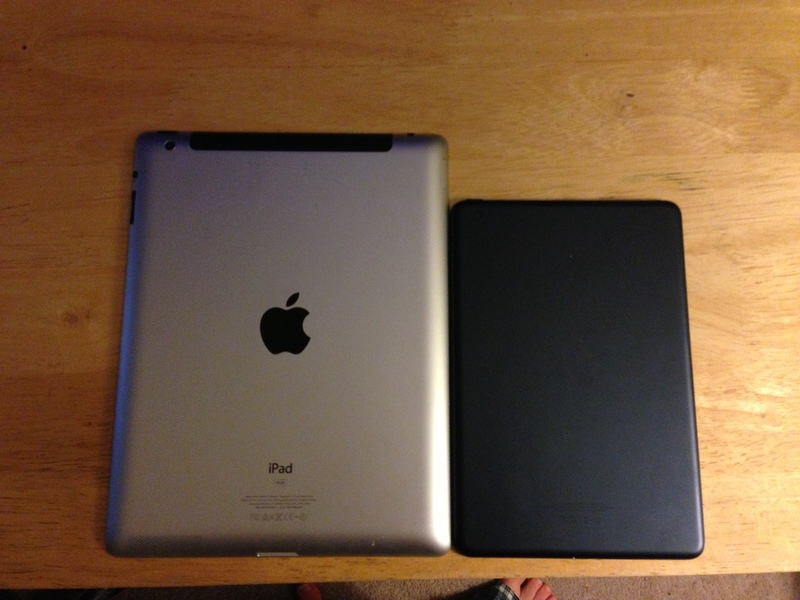 For example the mini has incredibly small bezels compared to the iPad. The thing is however you can still rest your thumbs on each side of the device fully touching the screen and the software can tell you are just resting so the software doesn’t freak out. It’s something you won’t notice but would be annoyed with if it wasn’t there. Of course you also have siri and that is either a hit or miss with you. I also like that they made the iPad Mini run iPad Apps and iPhone apps. However be warned the iPhone apps will look TERRIBLE on the mini. 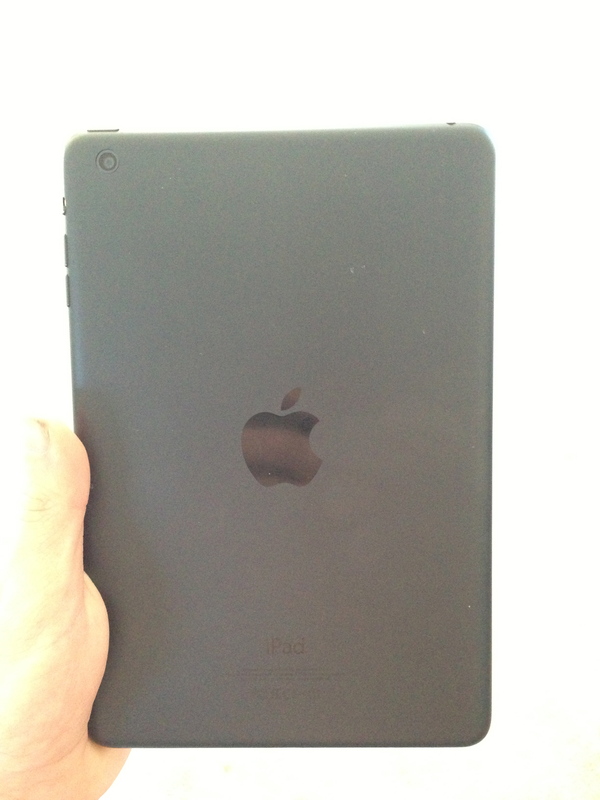 The iPad Mini runs the A5 processor found in the iPad 2, iPhone 4s, and iPod Touch 5. Even though the processor is a few years old apps launch fast and the operating system can keep up with lots you have to throw at it. How it stands in a few years will be anyones guess but for now the mini handles apps and data very fast with wifi speeds at 43mb/s. LTE models will be available soon for all of you who need to use your mini without wifi… Or you could do what I do and tether your iPhone to the mini, your call. So which one should you go for the iPad 4 or Mini? Well the answer is a lot more complicated than you might think. If you already have an iPad with retina display I would say stay away. If you are looking to upgrade the iPad 4 with the new A6x and retina display may be the way to go. It runs everything a lot faster and has an amazing retina display. However it is big. If you need something portable and light you should go with the Mini. The screen isn’t that bad and it does run thing very fast. It would make a great iPad for most. It all depends if you want small and portable or big and powerful. The iPad Mini is great. The worst thing about it really is the screen which really isn’t that bad. The price makes it a little less compelling to people who are looking only at price however in terms of usability you will want a mini over the competition. You can use both iPhone and iPad apps on the mini which make it better than android tablets which have mostly blown up phone apps not optimized for the display like iPad apps for the mini. The form factor is great and the software is great as well. The mini is very fast and is portable as well. The design is great and it feels remarkable to use. In some ways it is better than the big iPad 4. It all depends what you are looking for big and powerful or small and portable.